Famille rose. 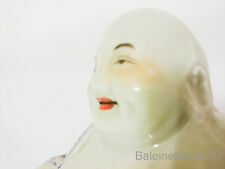 Antique porcelain chinese laughing buddha. Republic era. TwoChinese Foo dog Statues. Material: terracotta. Age: Unknown. From the tomb complex of the first Han emperor, Gaozu (206–195BC) or surrounding graves. They were created at the dawn of the Han dynasty, presumably around the end of the first Han-emperor Gaodi’s reign. 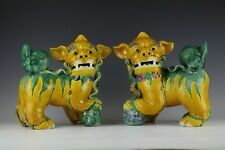 Gorgeous Pair of Antique Chinese Glazed Foo dogs CHINA mark Circa 1900. 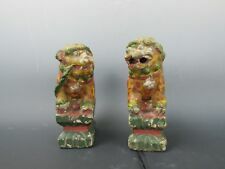 7.75"
Gorgeous Pair of Antique Chinese Hand Painted Nan King foo dogs. Acid etched CHINA mark, Circa 1900. Great colors and amazing details. Fee for this service dependent on size and if i need to bring help. Pair of Antique Chinese Nan King Turquoise Glazed Foo dogs CHINA mark 6.5"
Gorgeous Pair of Antique Chinese Hand Painted Turquoise Glazed Nan King foo dogs. Great colors and amazing details. CHINA acid etch mark circa 1900. Fee for this service dependent on size and if i need to bring help. From Lenwile China Ardalt Verithin. This maintains the golden Ardalt Lenwile Japan paper sticker. She is also known as the Goddess of Compassion. In Buddhist tradition she is a bodhisattva. This is a soul who is fully realized and no longer needs to reincarnate, but chooses to do so in order to enlighten others. A Chinese Foo dog Statue. Material: Porcelain. Model No. : MS102117 #9-1. No serious defects noted. Fingers intact! There are a few rough edges consistent with age, but nothing of substance. Hawaii, Alaska, APO & Protectorates. Also I appreciate any information or corrections if you see anything. 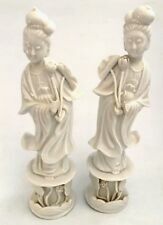 Chinese porcelain statues sculptures. Material: Porcelain. East Asia, China, Han dynasty, circa 200 BCE.